The aim of this project is to create an International and Intersectoral network to facilitate the exchange of staff to progress developments in reminding technologies for persons with dementia which can be deployed in smart environments. The focus will be on developing staff and partner skills in the areas of user centered design and behavioral science coupled with improved computational techniques which in turn will offer more appropriate and efficacious reminding solutions. 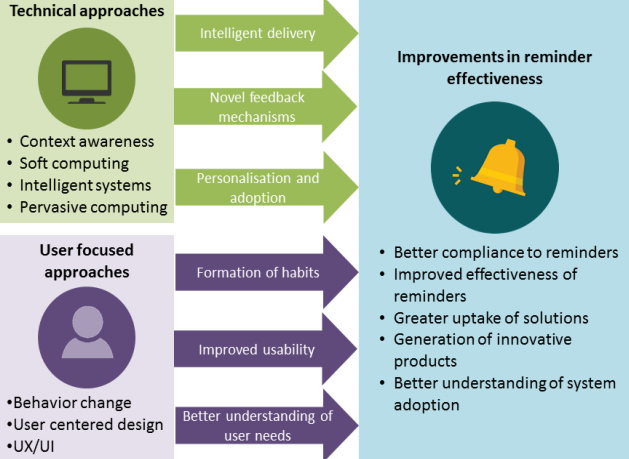 This will be further supported through research involving user centric studies into the use of reminding technologies and the theory of behaviour change to improve compliance of usage. A program of work has been established to maximise the transfer of knowledge between the different sectors offering a range of development and training opportunities for staff. Industrial staff will benefit from bi-lateral exchanges from the technical domains of context aware reminding technologies, soft computing, aware intelligent systems, pervasive computing and the psychological domain of behaviour change. The academic beneficiaries will benefit from gaining experience in the development of industrial standard software conforming to ISO and medical standards, engagement with stakeholders through a user-centred design process and working with organisations delivering care to the elderly and persons with dementia. The consortium is comprised of an International network of beneficiaries and partners, all of which are committed to progressing the notion of reminding technologies within smart environments. under the Horizon 2020 programme.